Trendy, eye-catching office space located in a highly-trafficked business district. WHAT IS IT: A newly-renovated modern office space located in the heart of Gainesville's central business district. WHAT'S COOL ABOUT IT: This trendy, spacious 2,397 square feet office is positioned in a highly-visible area near downtown Gainesville and the University of Florida campus. Work walking distance to restaurants, parks and a network of other businesses. WHERE IS IT: Innovation Square, UF's urban research community filled with high-tech startups. The 706 Building is located in Innovation Square, Gainesville’s high-growth business sector between the University of Florida and downtown. A popular hub for tech startups, Innovation Square provides companies headquartered in its community with a multitude of benefits. Businesses are able to network with other local firms, gain access to exclusive resources and research from the University of Florida, and seek exceptional employees with top-level talent from students graduating from the nation’s 14th-ranked public University. Employees at the 706 will located walking distance to Gainesville's highest-rated restaurants, cafes, and bistros - so they can conveniently recharge during break and quickly get back to work. Over 6,000 of the sharpest minds in Florida graduate every year from the University of Florida. 706 is positioned in an ideal location just steps away from campus, making it easy for companies to recruit these graduates into full-time employees. 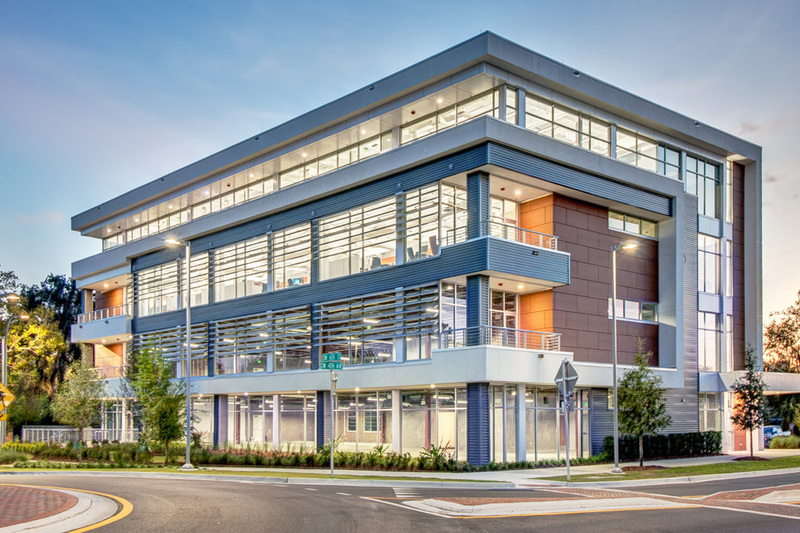 Nestled between downtown and the the University of Florida campus, the 706 office building is a free-standing, attractive workspace in Gainesville's commercial research community, Innovation Square. The 706 office space is positioned near a variety of cutting-edge local businesses, top-rated eateries and scenic parks, making it an ideal location to establish any company headquarters. Featuring over 2,397 square feet of office space, the 706 building includes 8 private offices, a large conference room and a spacious common area. Its unique exterior exhibits contemporary metal panelling and colorful, geometric-shaped architectural features, making it a building that's sure to attract the eye of anyone passing by in this highly-trafficked area. A one-of-a-kind building in Gainesville, the 706 building offers companies a great location and a modern, open office space perfect for any leading-edge company. 706 at Innovation Square features 8 private offices for breakout spaces and a large conference room perfect for meetings. The space also includes a receptionist's office and a large common area complete with a kitchen and two bathrooms. 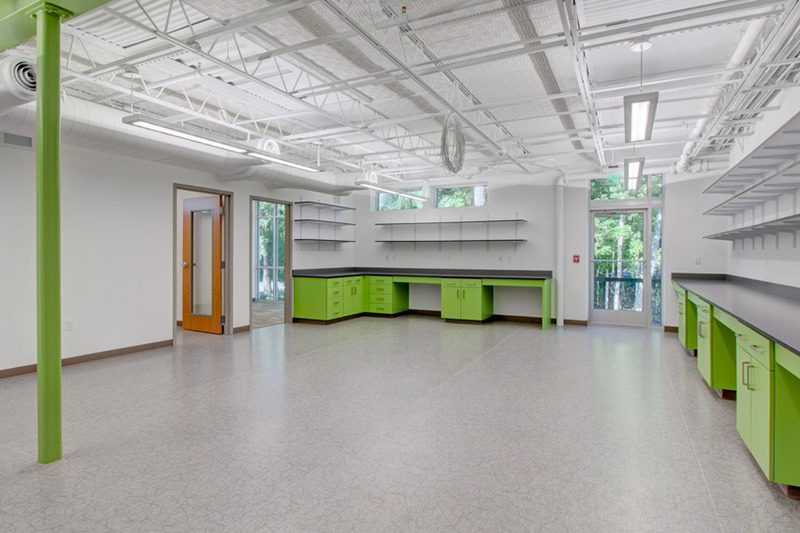 The 417 building features a fully customized 1,080 square feet. Located in Innovation Square, this is one of the nicest commercial properties in Gainesville. Features a private conference room and modern kitchenette.